While I thought this was better than the first book, Eragon, on the plot development level, it was just so slow and detailed that it was also worse than Eragon. The characters fell short for me this time around and the romance was kinda icky to me. 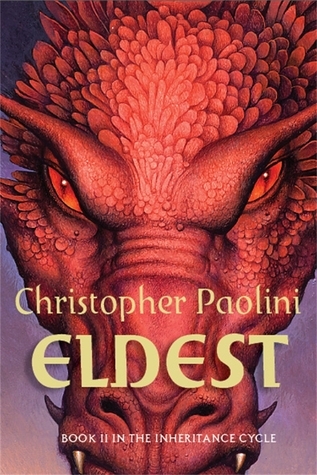 I do think that Paolini's mind is so creative and the world is so vast and detailed, which is everything you want in a fantasy. But I think in this case it is just too detailed. There are some things that are described and mentioned in here that are just unnecessary and they fill space. Which is a problem because this book is almost freaking 700 pages. Don't get me wrong, I sped through it. I loved it. I am a fan of this series. I just think that sometimes there were too meticulous of details that the reader didn't necessarily need in order to enjoy the story. The fact that Eragon fell in love with Arya was just icky to me. He is 16, she is over 100. The only good thing is that she pushes him away and tells him that they cannot be together. Like thank you magical elf lady for saving us from what could be a gross disaster. But there was also no real reason for this to happen. Why was this even part of the plot? What purpose did it serve? Like I liked Arya, she is a cool badass elf who is basically living my dream life. But I am not sure she has the qualities I -- or Eragon -- should be looking for in a relationship. Overall: 3.5/5 stars. I enjoyed the story, especially the plot and the turn that this one took in story development. I think this one had better developed characters that seemed to be more then just their fantasy stereotypes. I am very much a fan of this work and recommend it to those who are starting out and have not read a whole lot of fantasy novels before.